Congratulations, you’ve made it through the toughest, most challenging part of the program! The majority of people engaging in this lifestyle should feel pretty darned good after completing the initial unpleasant 10 days. Now it gets easier and easier, you will become healthier and healthier. Many of the processes that began during the initial 10 days consolidate and strengthen in these subsequent few weeks. If, however, you are among the minority whose detox/withdrawal symptoms continue longer than 10 days, it is perfectly fine to continue the simplified program of the initial 10 days, including the simpler first 10-Day Menu Plan. Join in with the more elaborate menu plan when you start feeling stronger and more energetic, which should not be too far off. While the initial 10 or so days are defined by the detoxification and withdrawal process, these next few weeks are defined by the health improvements that gain traction in your body. If the pain and swelling of rheumatoid arthritis, for instance, began to recede modestly during the initial 10 days, most people experience more dramatic improvements over the next few weeks. If you experienced a marked reduction in need for insulin for your diabetic blood sugars, you should continue to experience a reduction in need, perhaps be able to eliminate, the insulin altogether. You should be ready to explore some of the new recipes in the Undoctored 42-Day Menu Plan, including those that seem indulgent—like cookies or pizza—that now become health foods that raise no concerns about weight gain or health impairment (aside from the dairy issue). You want to gain the confidence of knowing that you can indeed enjoy a birthday cake or pumpkin pie if prepared with safe ingredients. You can have a family or friend get-together and serve healthy foods that grain-consuming people can eat and enjoy (even though you cannot enjoy the foods that they may serve without becoming ill—navigating social situations is another conversation, but something you can indeed manage safely). Three meals per day are specified in the Menu Plan, but this does not mean that you need to adhere to a three-meal-per-day schedule. Eat if you wish, do not eat if you are not hungry. Also, only some desserts are specified day-to-day, but feel free to add the dessert recipes included whenever the impulse hits. All dessert recipes are compliant with this lifestyle and can even be used to replace other breakfast, lunch, or dinner foods, since all unhealthy ingredients have been removed and replaced with healthy alternatives. Yes, it means that indulgent foods like cheesecake or pizza, because they are prepared with only safe, healthy ingredients, can now even serve as a meal—cheesecake and pizza for breakfast! We also encourage you to enter your health data in the Undoctored Low-cost Health Care Insurance Project, our effort to collect the data of hundreds and thousands of people—anonymously, of course—so that we can prove to the world just how healthy and slender we all become through the Undoctored process. Ideally, you enter your health data at day 0 (on or before your start), 30, 60, 90, and 180 (6 months). This is our way of tabulating how much weight people are losing, how many fewer medications you require, how many health conditions recede. Please post questions, uncertainties, reports of your experiences, etc. 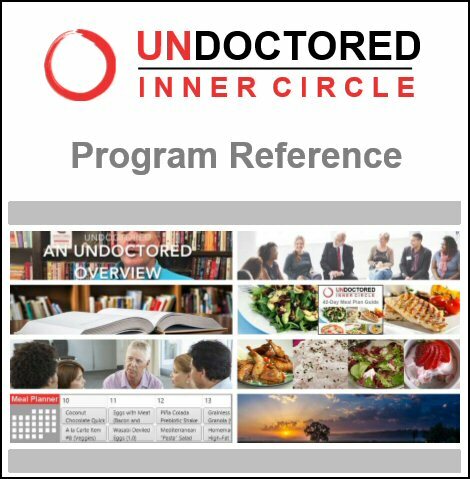 in the Inner Circle Forum, the Undoctored Blog, the Inner Circle Virtual Meetups, and the Undoctored Facebook page. We are all in this together, all part of our effort to achieve magnificent health and slenderness accomplished on our own and with little to no interference from the healthcare system. Let's talk about the next 32 days of your Undoctored Wild-Naked-Unwashed program. Now if it's been 10 days, but you're still going through the detoxification / withdrawal process — still don't feel good, maybe you're still tired or nauseated, have a hard time functioning day-to-day, well you can postpone this part of the program for when you're finished. I want you to feel good before you start this part of the program. Here, you're going to add some new components to the program. I want you to feel good and have energy to do this. So if you're still feeling bad, let that process run its course. It should be coming to a close very soon. Very rarely does it last more than two weeks, but recognize that some people do indeed have a longer detoxification / withdrawal process. Once you're through, come back here. Now, if you are indeed all finished with your withdrawal / detoxification process, now is the time to expand your menu of food choices, of recipe choices. I hope you'll have more energy now, to shop and cook, prepare some of these more interesting recipes — and not just rely on some of the old simple standards. Now is the time to learn how to make healthy breads, and cheesecake, and how to bread meats with delicious breading that won't impair health — how to make pie crusts; all the things you might have come to miss these last 10 days or so, that you're going to re-create, with healthy alternative ingredients. You'll find this all in the recipes provided in the Undoctored program. There's also a meal plan that you can use, our 42-day meal plan, that we have filled up with lots of recipes for you, or you can modify it and personalize it, as you see fit. You can move the recipes around. It's a drag-and-drop practice: very easy. You can change it to suit your schedule. You can make it longer, add days, subtract days. You can even add some of your own recipes. Know that you can modify the menu plan to suit your own interests. But please stay on course — very, very important, right — that you stay free of grains, continue to count your net carbs, and go no higher than 15 grams net carbs — and stay on course in the other aspects of the program. So how many meals per day should you have? As many as you want. Most people find that 3 meals per day is just too much food. You may find, for instance, that a full breakfast at 7:00 AM means you're not hungry for lunch. You might snack on something small, and then have dinner, or maybe you skip lunch altogether. Or maybe you have a full breakfast, and a nice lunch, and you're not hungry at all for dinner. These are very common observations or experiences on the Undoctored program. So you eat as you see fit. You can have snacks. You can have more meals, if you like, but that's kind of uncommon, particularly if you're adhering to our advice to indulge in lots of healthy fats and oils, which are very satiating. Don't be surprised, if you wake up, not hungry for breakfast, or if you find yourself not interested in having dinner, and you might have a little nibble of something, and then go to bed, wake up the next morning, and pick up where you left off. Don't be surprised if old habits will go away quite quickly on this lifestyle. You should also be on the full nutritional supplements program, including the full dose of your prebiotic fibers, provided you did not have adverse effects that lead you down other paths. If you did not, you should be up to the full 20 grams of prebiotic fibers per day, either as Undoctored detox shakes, or in other ways, all described in the book, and the Inner Circle website. You should be still on all the other supplements. You should be completely up to speed on all your nutritional supplements. These few weeks, also, after initial detox/withdrawal, are when a lot of the health changes, health improvements, are consolidated. It's when blood sugar is plummeting, if you're a Type II diabetic. Blood pressures also drop, if you had high blood pressure. Now remember, those two special situations: diabetes, and high blood pressure, need to be managed very carefully. You do not want low blood sugars, nor low blood pressures, so there are special videos and conversations about those issues. But these changes should be getting underway very powerfully. If you have an autoimmune condition, you should start feeling relief over these few weeks. Many other conditions begin to make a powerful retreat. You should start feeling better and better with each passing week in this program. Now some problems take longer than 6 weeks to unfold. Say you have 125 pounds to lose. It's not going to happen in 6 weeks. You should get off to a very good start, during these 6 weeks. 15 to 18 pounds is very common, sometimes more, sometimes less, but you should achieve some weight loss during this period, often substantial. But if you have a whole 125 pounds to lose, it's going to take longer. But a lot of the changes that allow you to lose that 125 pounds should be underway in this 6 week period. And many other changes get underway. One of the things you do not want to do is have blood drawn, if you can avoid it. Because so many powerful changes are at work, including on-going weight loss during these 6 weeks, that blood-work is often distorted. It's part of the natural process of weight loss, but many doctors don't understand that. They try to “treat” the distortions of your blood values during natural weight loss. You should not allow that to happen. They'll often see, for instance, higher triglycerides, lower HDL cholesterol, higher blood sugars, or erratic blood sugars that are transient, and then come down later — and likewise erratic blood pressures. This is all part of the weight loss process. That's because weight loss, the kind of powerful weight loss that occurs in the 6 weeks involves mobilization of triglycerides and fatty acids from stored fat, into the blood stream. That distorts your blood patterns. It's natural. It's safe. But it's very confusing. If possible, do not have blood drawn during the 6 weeks. Try to postpone any blood work, particularly the cholesterol-type blood work, for at least 4 weeks after you achieve a weight loss plateau, which might not be for quite a while, right, if you have a lot of weight to lose. So enjoy these few weeks, because this is where your health will be turning some very powerful corners, and I believe, I predict, that at the end of these 6 weeks of the Undoctored Wild-Naked-Unwashed program, you may no longer be recognizable — you'll be so healthy.